Qantas has once again dropped the price of their flights from Vancouver to cities in Australia, this time down to between $798 and $875 CAD roundtrip. And this time there are 2019 dates available. You can find these flights departing from Victoria (YYJ) for about $67 more. You can also turn these into 2-in-1 trips and visit both Australia and San Francisco (or Los Angeles), for about the same price (instructions below). You can also look at flying into one Australian city, but home from another, for about the same price (instructions below). - look for the dates that are somewhere between $908 and $924 roundtrip. - the price on Skyscanner or Flighthub will usually be around $75 to $150 cheaper than what you see on Google Flights. You may also want to try using the filters on either site to narrow it down to flights that are only 1 stop each way, if they're available for a low price. 1. First, try finding a normal roundtrip flight to Australia, using the Google Flights links above. 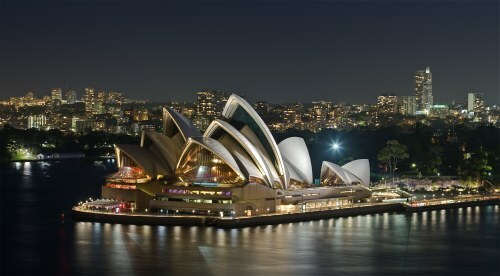 For example, let's say you found a flight from Vancouver (YVR) to Sydney (SYD), from Feb 13 to Feb 27. - For the first and last legs of the journey, use the dates from the normal roundtrip flight that you found on Google Flights. - You can play around with the middle date to give yourself more or less time in Sydney vs San Francisco. For example, here is a screenshot from Kayak of Feb 13 to Feb 24 to Feb 27. You can also try Los Angeles instead of San Francisco. - Try the dates from the normal roundtrip flight that you found on Google Flights. For example, here is a screenshot from Kayak of Feb 13 to Feb 27. You'll notice the flight from Sydney (SYD) to Brisbane (BNE) is not included. You can try a multi-city search on Kayak that includes the flight between the two Australian cities. It may only bump up the price by a little bit. It's even possible to visit multiple cities in Australia *and* Los Angeles and still keep the price under $875! vancouver, yvr, flight deals, victoria, yyj, australasia, australia, sydney, syd, melbourne, mel, brisbane, bne, qantas and oceania. 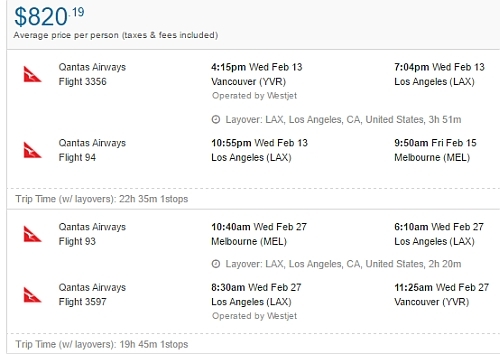 One Response to "Vancouver to Sydney, Brisbane, or Melbourne, Australia - $798 to $875 CAD roundtrip | 2019 dates available"
This deal is expired now I think.